It’s hardly a rhetorical question when you’re standing drenched to the skin, watching raindrops bore holes into the curry you’re desperately trying to heat over a flickering camping stove. Your muscles ache, but you can’t sit because the picnic table and ground are sodden. Darkness is all around you, lit only by the stove and the weak ripple of LEDs from the camp lamp through the rain. Behind you, the tent is battered by rain: Rivulets are pooling on the top and running down the sides, and you’re pretty sure the inside is damp as well. And the plummeting raindrops are cooling the curry as fast as you’re trying to heat it. I’m turning the question over in my mind—Why is camping fun?—but first and foremost I’m wondering whether the curry will ever heat up. Finally, it does, and the craters created by falling raindrops are augmented by bursting bubbles as it reaches a slow boil. We dish it out in our specially-insulated plastic bowls, and damn if it isn’t good. Best curry I’ve ever eaten—even if it is the vacuum-packed kind you get at Duane Reed (improbably shipped over from India). It’s spicy, warm, and filling—goes right to the pit of your stomach and sends heat radiating outward to your fingers and toes. After the curry’s finished, we leave the cleanup for the morning. There are no bears on this island, so the dishes can stay out to be washed by the rain. Bathing gets similarly short shrift: We’ll deal with it in the morning. It’s been a long day. Fortunately the tent’s up and the air mattresses are inflated, and even better, the tent doesn’t leak. (At least not yet.) We crawl inside and fall asleep to the sound of rain in the trees. We knew the weather wasn’t going to be great. Rain was predicted for pretty much the entire time, heavy at first and tapering off into a mix of clouds and sunshine by the end. But there’s nothing new in that: Johna has an almost unerring ability to generate rain on excursions. All it would take take to end a 20-year drought in the Sahara would be to have me plan a camping trip there. Torrential downpours would ensue the minute I announced my intentions! Fortunately it wasn’t raining when we unpacked the car. We’d left New York a bit after ten, and arrived in Albany around 1:30 PM. By the time we had everything out on the dock it was closer to 2:00 PM. The big challenge? To see if everything would fit. Amazingly, it did (though I had to stash water bottles on both sides of the skeg in the stern). Once Randy was confident he wouldn’t be carrying anything back for us, he said goodbye, and we finished packing. 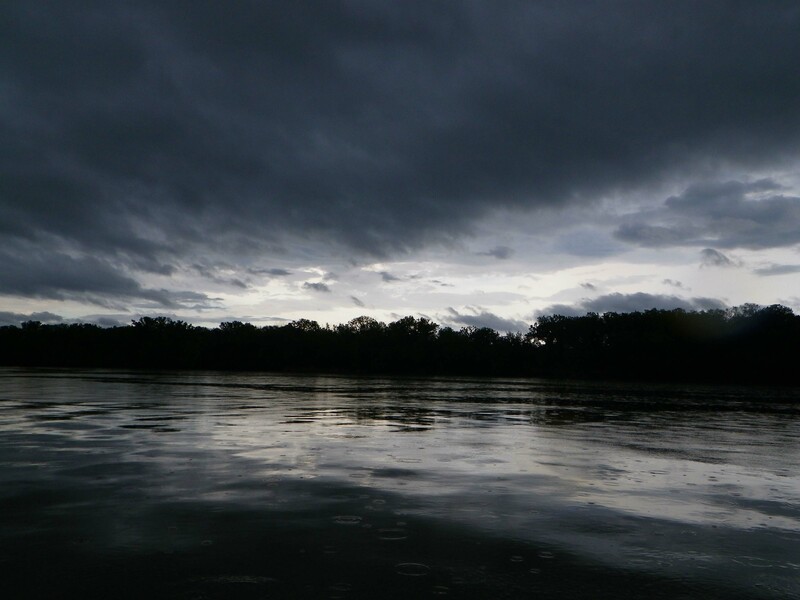 We set off into a day that was almost paddle-perfect: Overcast and cool, but not cold (around 68 degrees). 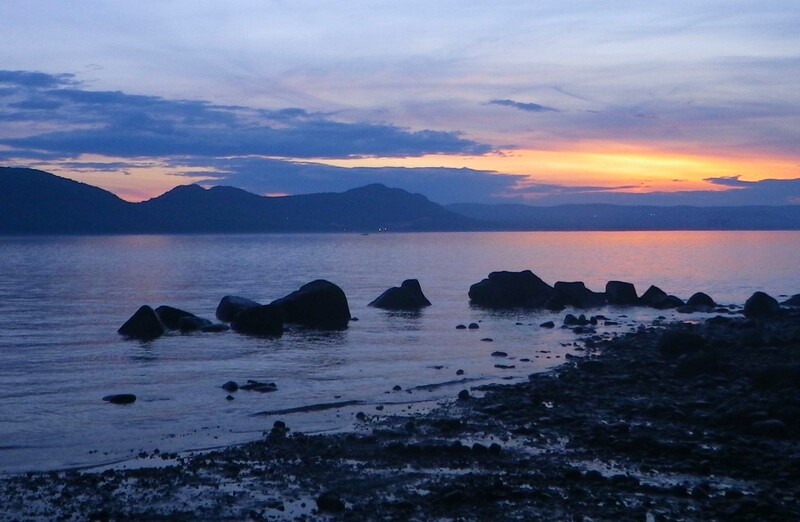 Even as far up as Albany, the Hudson is tidal, and in theory, the current would turn against us soon. 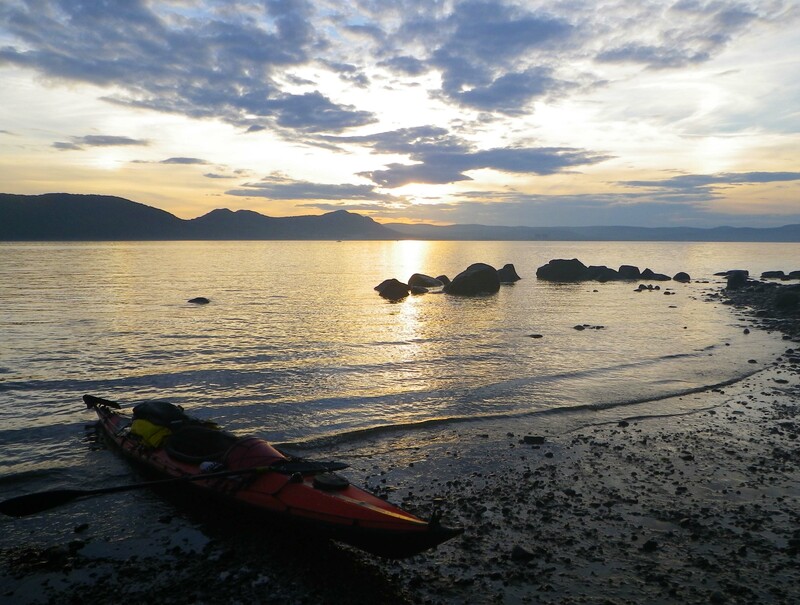 But instead a strong ebb current didn’t let up until evening; we didn’t have to paddle hard at all. That was good, because I was exhausted from lack of sleep (too many projects at work). At first, the landscape is rugged and industrial. 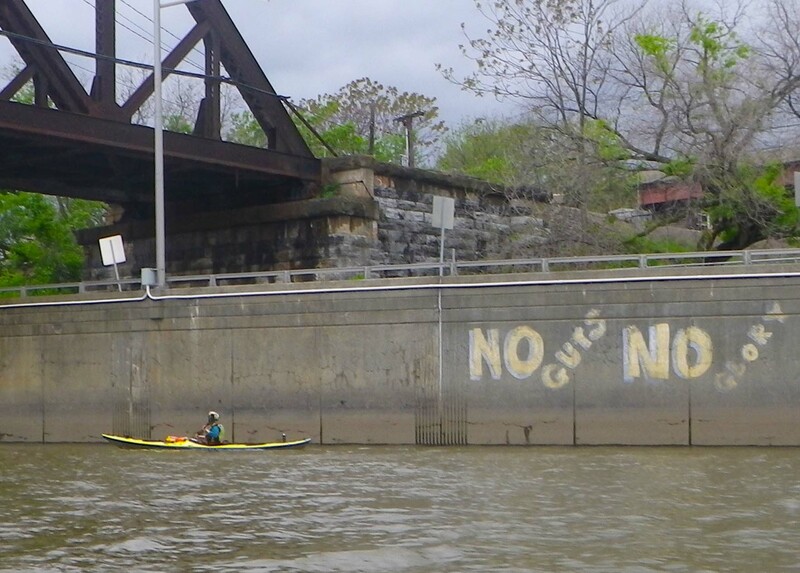 We float past a cement wall spray-painted with “No Guts No Glory” (which Vlad promptly takes as the motto of the trip). Then a couple of bridges and the weatherbeaten docks of the Port of Albany. Vlad calls this section of the trip “boring” but Johna is fascinated by the crumbling post-industrial feel. After a bit, the industrial parts end and greenery takes over. There are few houses, just endless trees along the riverbank. Then we pass a stretch of stately homes and nicely-manicured lawns (think of that wonderful line from The Great Gatsby about the lawn running down to the water). 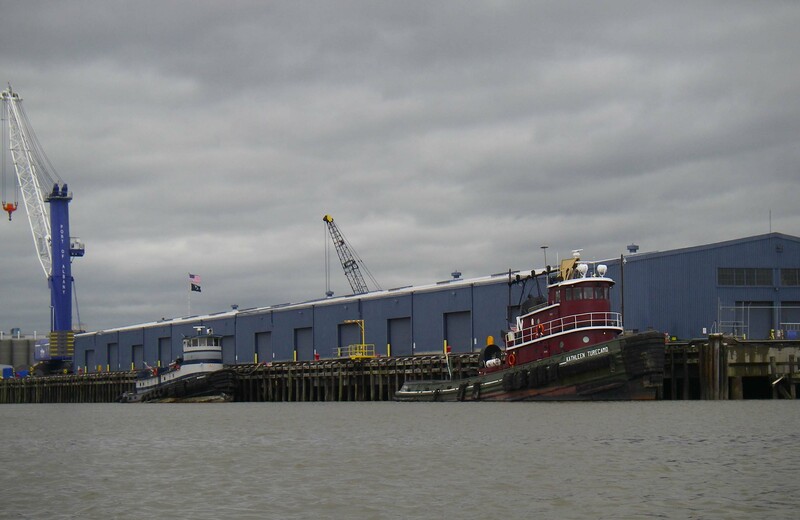 Then a few more bridges and a couple of red barges, colorful under the gray sky. And always, more trees. For the first few hours, the rain holds off. But eventually the clouds turn leaden, and I can see the sheet of rain in the distance. I’m practicing my weather-prediction skills, and unfortunately, they tell me the rain isn’t going away any time soon. The barometer on my watch concurs. Lightning flashes. After a long pause, thunder grumbles. It’s a thunderstorm, but it’s far off, and getting farther away. The rain sheets down, getting under our collars and trickling down our necks. The day goes from pleasantly cool to downright chilly, even with paddling jackets on, so we paddle faster to warm up. Plus, it’s beginning to get dark—and we want to reach the campsite before dark. 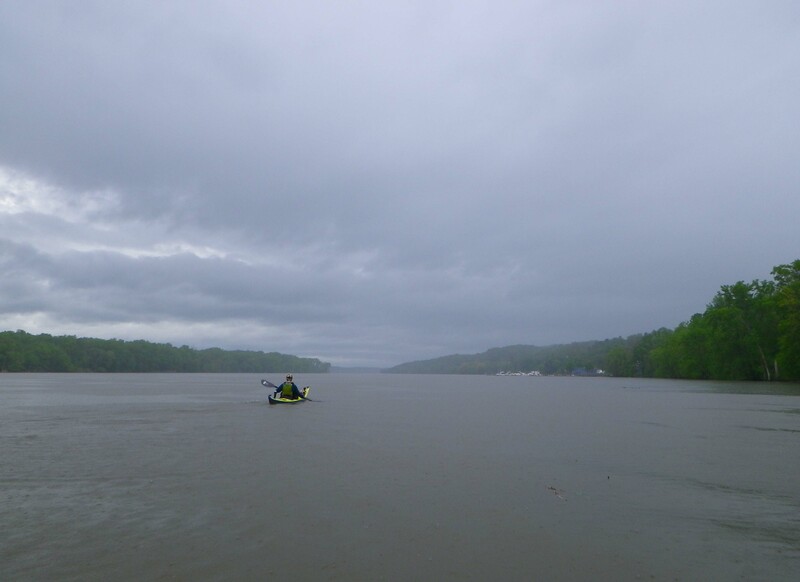 We paddle on in the rain, which slowly begins to decrease. … it’s gone. All I can see is the kayak floating upside down on the water. Then Vlad stands up beside it. “Watch out!” he shouts. “There are rocks pretty far out here!” He’s right: Even though we’re a couple dozen yards out from the island, just underwater is a long line of rocks, the remnants of the old river bulkhead. He pushes me off the rocks into deeper water. I wince inwardly at the scratches I’m sure I’ve inflicted on my beloved Photon. Vlad gets back into his boat and we paddle the last few yards to shore. Fortunately, the rain holds off as we disembark and set up camp. It isn’t until the stove is lit that it returns with a vengeance, drenching us (and the curry). I’m hearing its pitter patter down. That’s exactly right: nowhere to go, nothing to do, just paddle along in the sun and the rain. My blood is tingling, and I’m perfectly relaxed and at ease. The only thing I’m thinking about is the next stroke, the way the waves strike the boat, the play of the clouds overhead. And wondering idly about what will appear around the next curve of the river…..
… Hmmmm, it’s a boat. A large wooden sailing vessel. 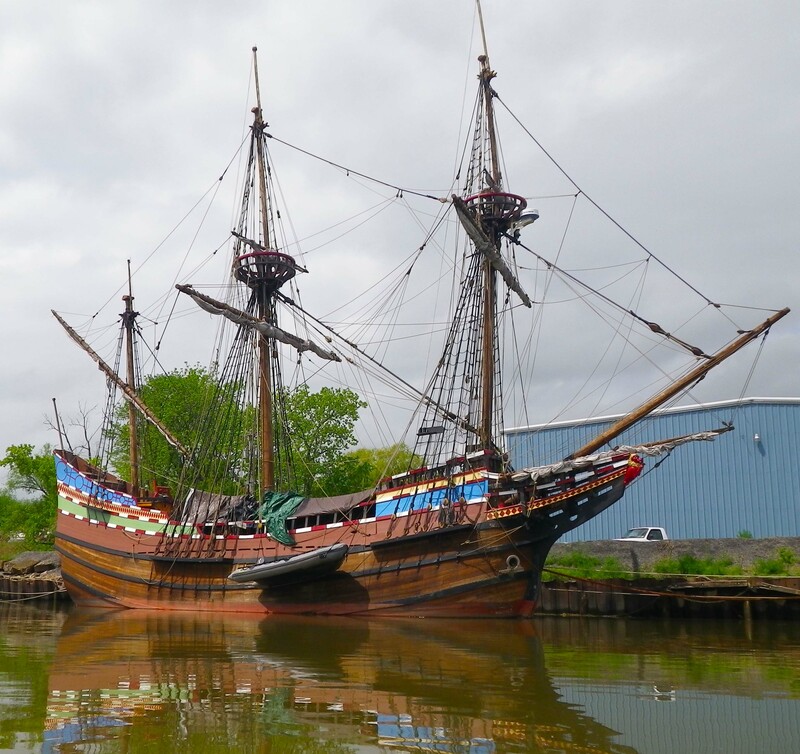 In fact, it’s the Half Moon, a replica of Henry Hudson’s ship of 1609. We paddle alongside, marveling at its small size and quaint design. Then we notice a man working on it in the sunshine. We chat, and he tries to recruit us for an upcoming trip, saying he needs deckhands. Vlad and I look at each other and shrug. Why not? In the spring sunshine, everything seems possible… and the idea of taking a multiday trip on a historic sailing ship has a certain appeal. Maybe later this summer, or next year, we tell the guy, and paddle on. 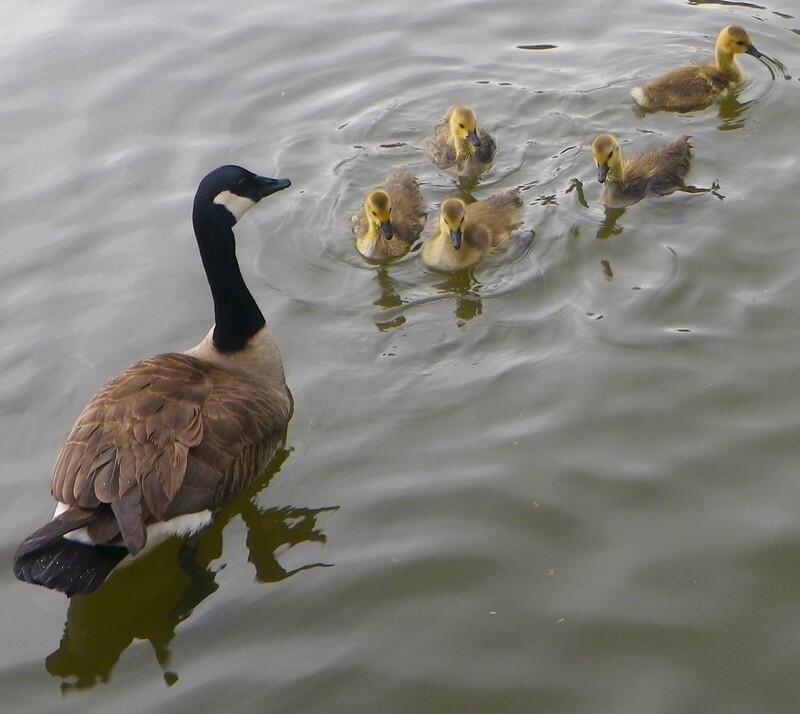 Overhead, we hear the honking of geese. We look up and see a great fractal “V” formation coming towards us. 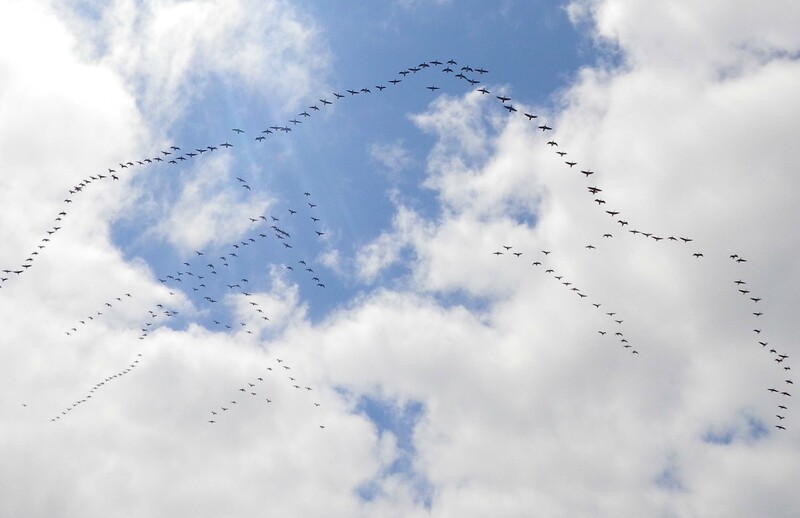 How do they know to travel in that formation, we wonder? We pass various small boats heading upriver. Several have the red-and-white maple leaf flag on the stern: Canadians heading home. It’s quiet; the geese have ceased their honking. The silence is broken every half-hour or so by the sound of a train rattling by (we’re on the eastern side of the river, so it’s Metro North or Amtrak). 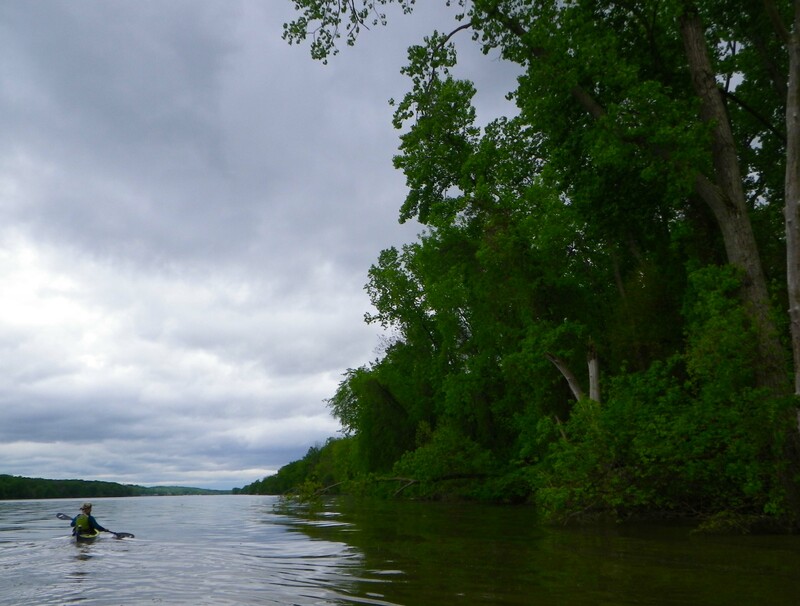 Otherwise, the only sound is bees droning, the leaves rustling, and the soft conversation of a couple of fishermen off in a boat in the middle of the river. After cheese, salami, and fruit, we’re ready to head off. The rest of the afternoon is a pointillist montage of sun, clouds and sky, dappled green leaves and gray-blue water. The Catskill Mountains are off in the distance. We pass several interesting structures, including Saugerties Lighthouse. But as we paddle, there’s a growing unstated sense of .. not worry, exactly, but concern. 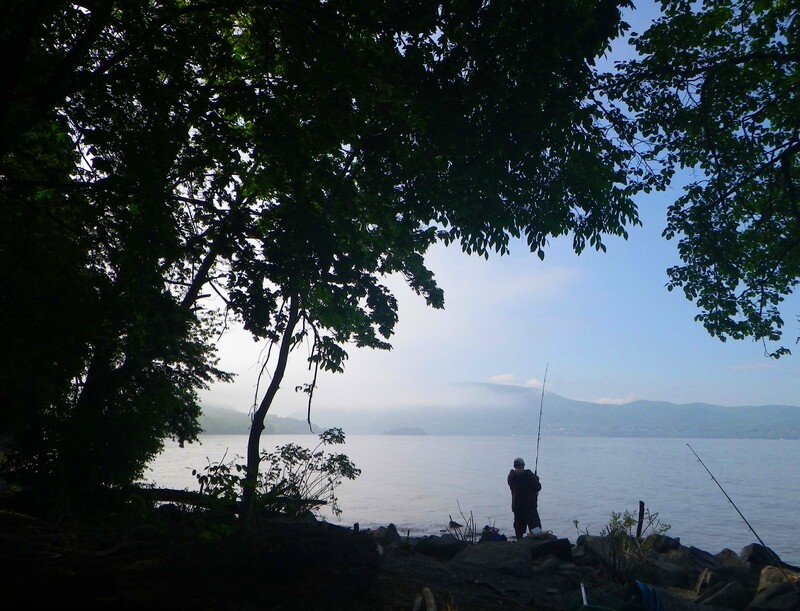 We’re a little behind schedule for the camping spot Vlad has in mind, Esopus Island. Well, actually, a lot behind. Between our lateish start, longish lunch, and leisurely pace, Vlad is afraid we’ll arrive after dark. After last night’s experience, that’s not something we want to deal with (the only thing worse than pitching a tent in the dark is pitching a tent in pouring rain in the dark). The solution? Commando camping. Vlad knows of a couple of islands not too far off. He’s been there before, but can’t quite remember the landing sites. I’m game. So in the late afternoon, we approach Magdalen Island and do a careful circumnavigation. Magdalen Island is quasi-famous as a site containing Native American artifacts, but we’re looking for treasures of a different type: A safe landing spot and level ground for camping. Luckily, Vlad’s sharp eyes spot a tiny beach, no more than a yard wide. We’re easily able to land the kayaks, and just up a short hill is a lovely flat (well, flattish) camping spot. Mindful of last night’s experience, we make sure to pitch the tent right away. Then we explore. 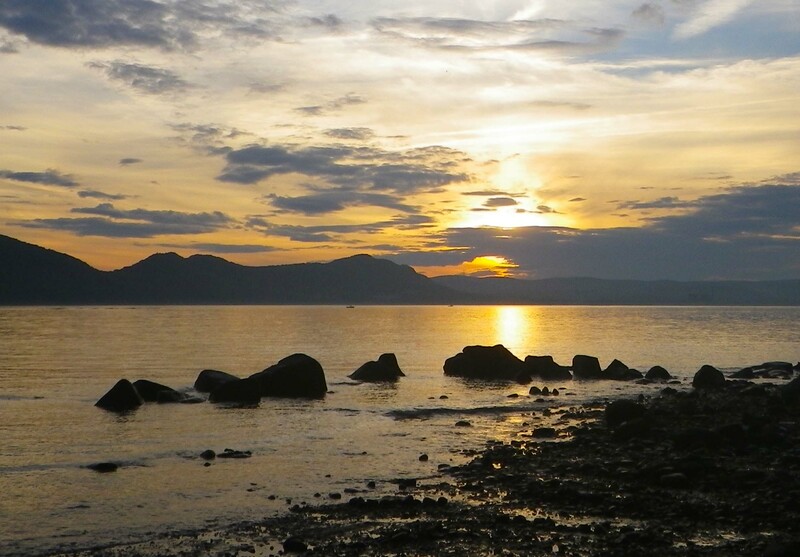 Magdalen Island is crisscrossed with little trails, and it’s easy to get to the western side of the island, from which we have a great view of the Hudson and (we hope) the incipient sunset. But it’s not to be. Soon enough, we hear the ominous rumble of thunder, and watch the dark clouds roll in. We hightail it back to the tent. Sure enough, the storm hits, with thunder and lightning accompanied by a downpour that’s positively Ragnarokian in intensity. After about half an hour we decide that cooking is a lost cause. Fortunately, there’s plenty of ready-to-eat food, which we’ve presciently stashed in the tent: Cold boiled potatoes, hard boiled eggs, salami, cheese, and dried fruit. As we chow down, listening to the wind, rain, and thunder, I find myself thinking yet again, “Why exactly is camping fun?” But the thought vanishes in the onslaught of the sweet and savory flavors. The next morning, mist rises all around us, but burns off rapidly. We have a leisurely breakfast, once again savoring the coffee (thank you, Starbucks!) and set off. The weather is much like the afternoon before, a patchwork quilt of clouds and sun. 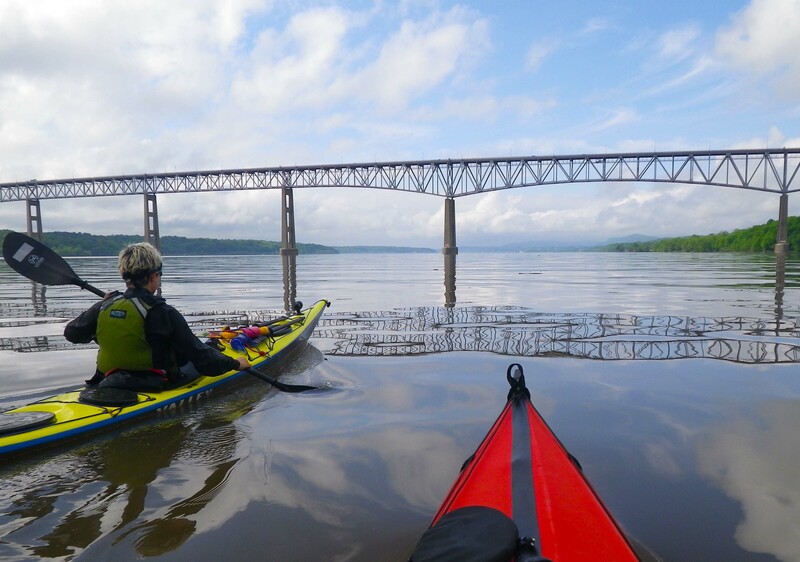 We pass Rhinecliff Bridge and Kingston and Esopus Meadows Lighthouses, and arrive at Esopus Island (last night’s planned campsite) in the late morning. 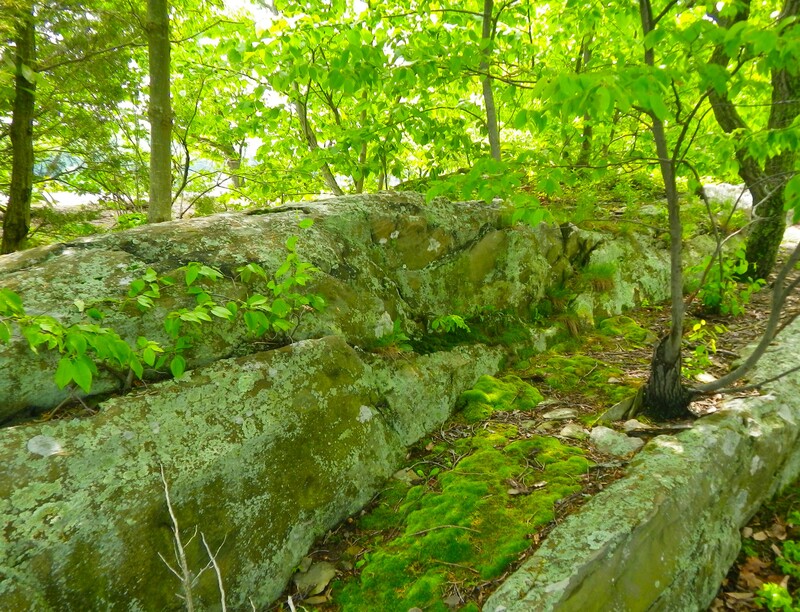 Esopus Island turns out to be fantastic: Terraces of mossy stone, glowing in the peekaboo sunshine. 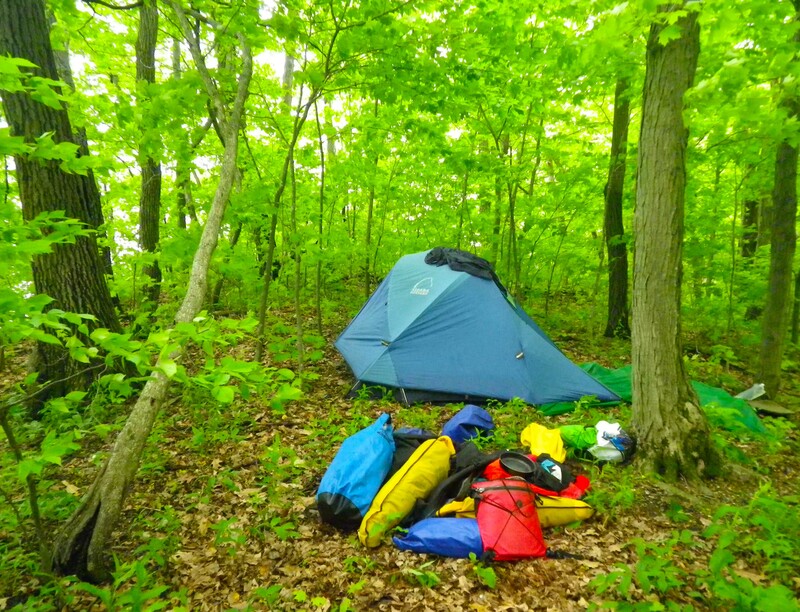 There are wonderful campsites at the top, plus a dappled wood to explore. We stop and have another meal, and promise ourselves that we’ll camp there someday soon. Then it’s back into the boats for the next leg of the trip. The current is turning against us, so we hug the banks of the river. Periodically a train rumbles by. On the Western side, the tracks are commercial (CSX and others) and the trains are long: Sometimes it takes 10-15 minutes for the train to pass. The Eastern tracks handle Metro-North and Amtrak commuter traffic: Much shorter trains (sometimes only 5-10 cars) but a lot more bustle. Above the tracks, on both sides of the Hudson, are mansions from years gone by. Just north of Poughkeepsie, there are the Vanderbilt, Rockefeller, and FDR’s Hyde Park mansions. As the green hills glide by, dotted with white buildings, we wonder about the other vanished tycoons of yore: Do family members still frequent the old houses? Or are they lying empty, or have they been turned into museums? By mid-afternoon, the sky is two-toned: Behind us, there’s sunshine and blue sky, but ahead of us, black clouds hang in baroque curlicues. The black clouds continue to mass up. Suddenly there’s a flash: An enormous bolt of lightning has split the sky. I start counting. Eight seconds later, the roll of thunder. I glance over at Vlad. We’re too far apart to talk, but I can tell from his body language he’s unconcerned. Once again, the lightning cracks, and the thunder rolls. This time it’s twelve seconds—four more than previously. The storm is ahead of us and headed south. We’re okay. It’s just going to be exciting paddling for a while. The rain comes and goes, but it’s clear the serious action is ahead of us, where the thunderstorm roils and growls. For the next few hours we watch the drama in the sky. It’s getting colder, and my stomach is reminding me I haven’t had a hot meal in more than a day. Maybe there’s someplace we can stop and grab lunch? As luck would have it, there is. We stop at a lovely town called Highland, just north of the Poughkeepsie bridge, on the other side of the river from Poughkeepsie itself. 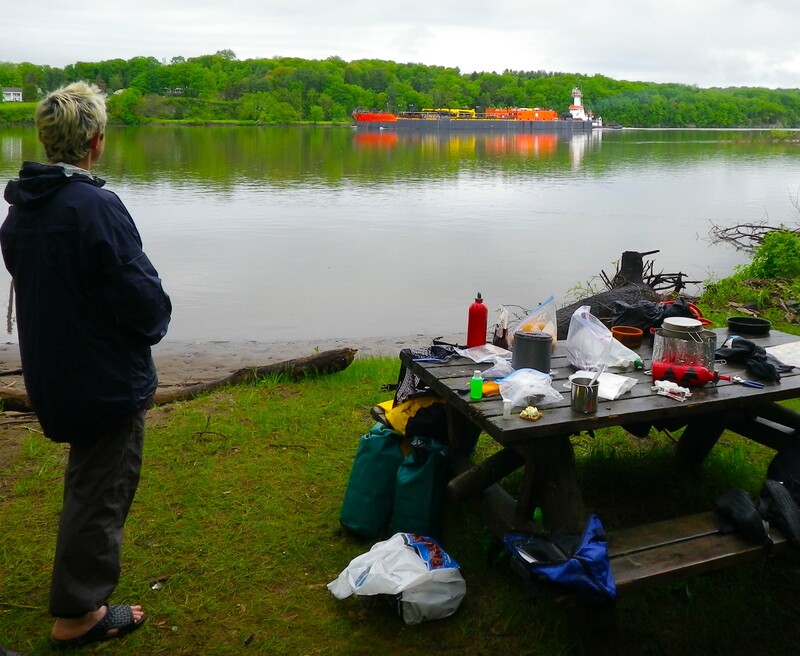 We stash the kayaks on the river side of the train tracks, then walk a short distance to a riverside restaurant where we enjoy clam chowder, fried clams, and several cups of coffee. There’s something decadent about a restaurant meal in the middle of a camping trip. 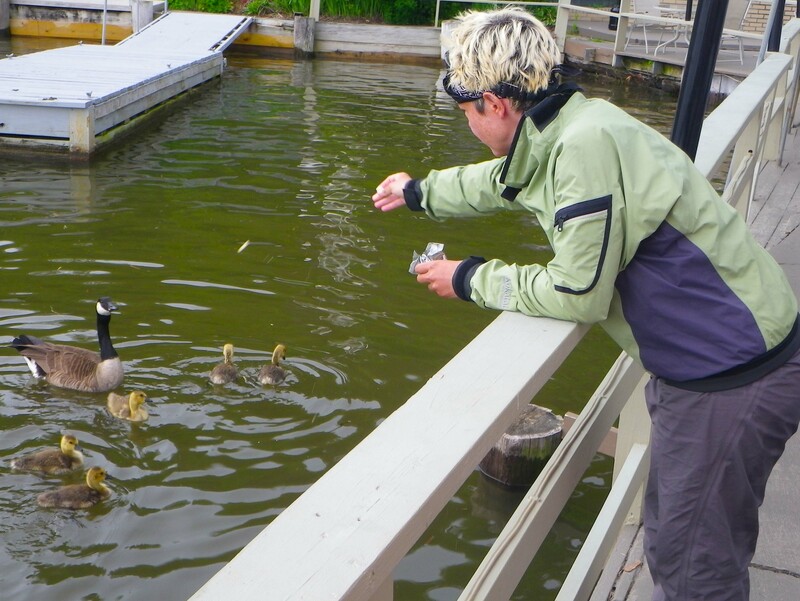 But we have miles to go before we sleep… so we reluctantly bid goodbye to the restaurant and to the friendly family of geese we’ve encountered there, and launch on our merry way. Somehow the rain doesn’t seem so bad now. We arrive at our next campsite, at Denning Point, just south of Beacon, shortly before dark. Wonder of wonders, not only is the evening dry, but we have a fantastic sunset. The entire night is warm and dry, in fact, although around 2 AM we’re awakened by a bunch of fishermen passing by, chattering animatedly in Spanish. The next morning we awaken to see the river shrouded in fog, which doesn’t clear until nearly 10 AM. But that’s okay: The weather blossoms into a beautiful sunny day, one of the first serious days of Spring. 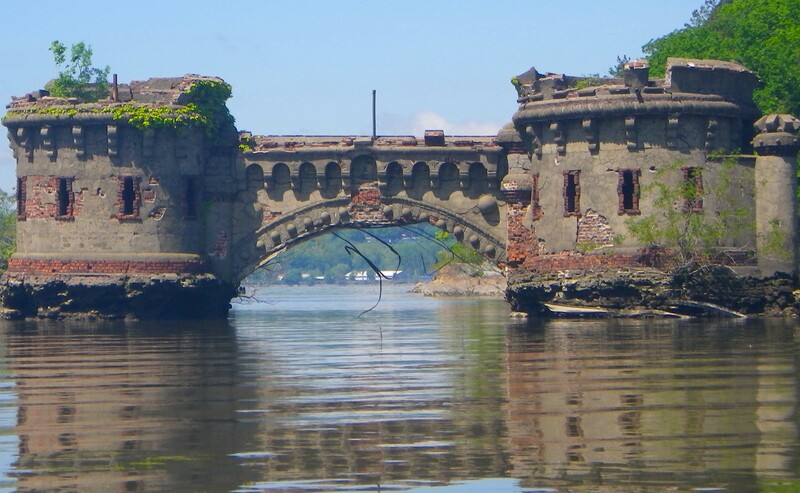 And we’re en route to Bannerman’s Castle, one of the most amazing structures on the Hudson River: A genuine Scottish castle, falling into genuine ruins, that used to serve for munitions storage. Paddling under, over, and through the ruins in the bright sunshine, I can’t help getting goosebumps: This is one of those experiences it’s impossible to have unless you’re a kayaker. 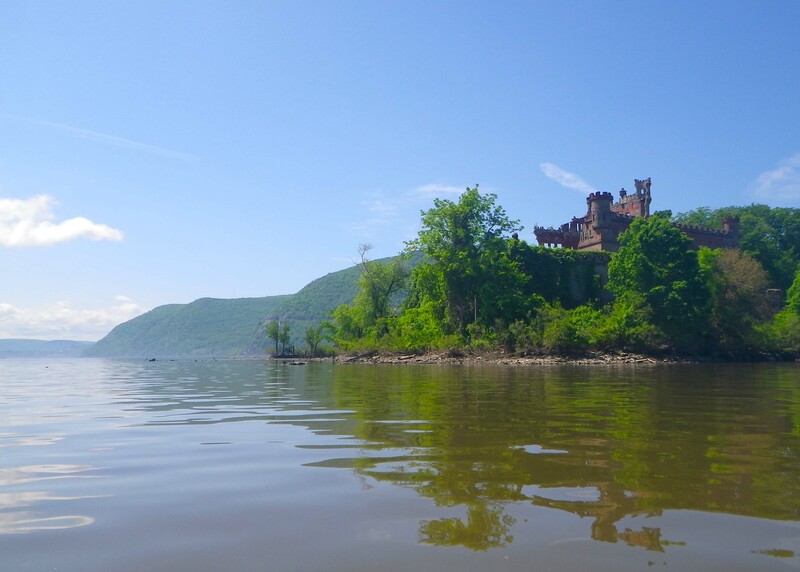 Bannerman’s Castle is a visually compelling, quixotic piece of New York’s history. 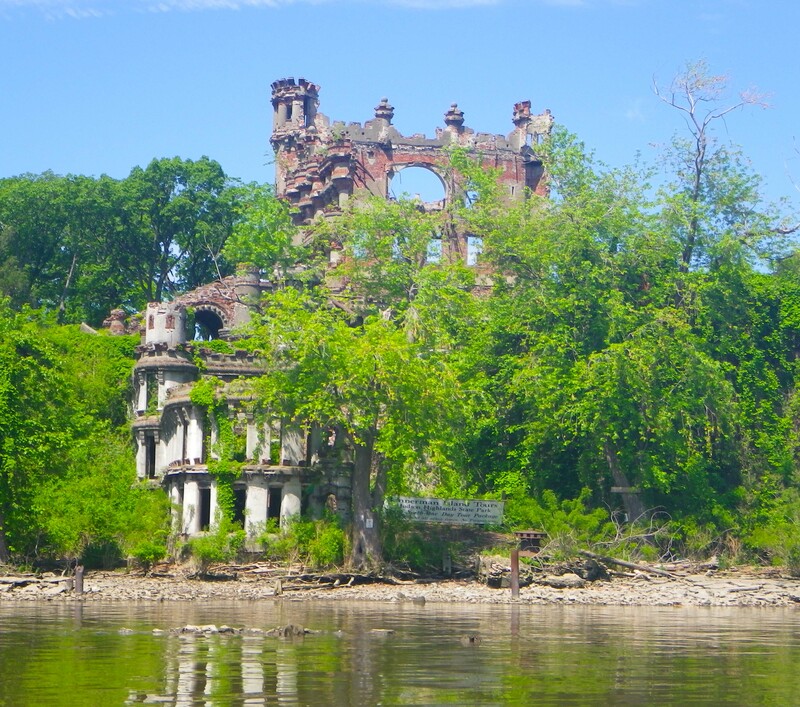 As I paddle close by the ruins, I feel fully alive. After Bannerman’s Castle, things seem to speed up. We race by West Point. (I point out to Vlad the “Beat Air Force!” sign painted on top of one of the athletic buildings, and explain the significance: As a former Navy Jr., I’m fiercely aware of the competitiveness among the military academies.) 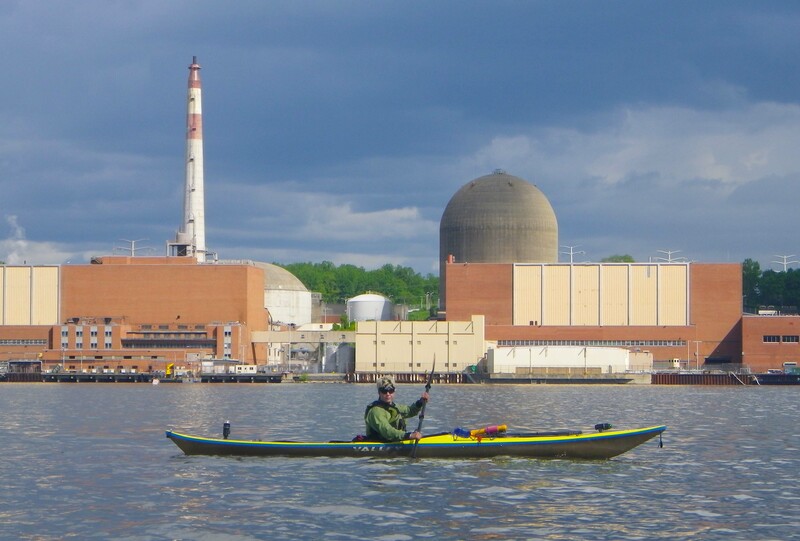 Then there’s Bear Mountain Bridge, followed by Indian Point Nuclear Power Station. 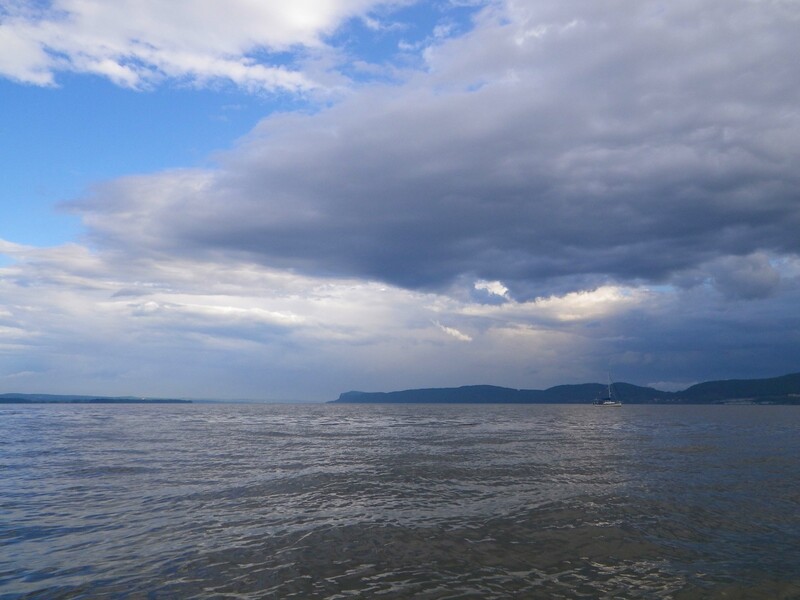 By late afternoon we arrive in Haverstraw Bay, a widening of the Hudson River where the current slows and the horizons drop back. And, just as we pull out into the bay, leaden clouds pile up once more and a brisk wind begins to blow. It’s a serious squall, possibly with a thunderstorm in tow. The wind is blowing loudly enough to block out all sound, and for a few minutes it appears as though we’re encountering serious conditions. Vlad and I agree: This is no time to take chances. 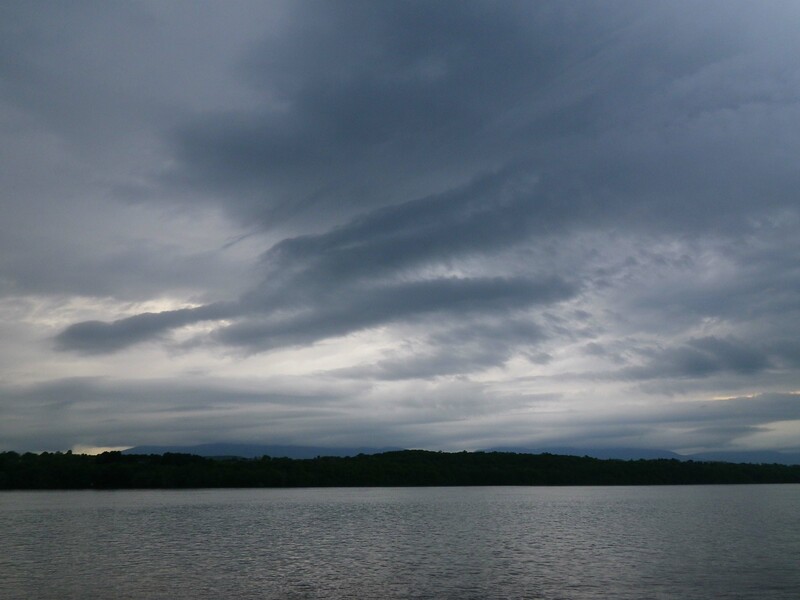 So we head for shore and land in a local park, just as the clouds clear and sunshine breaks out once more. But that’s okay. We were overdue for a break, and it’s interesting to explore the park, which features an almost Germanic obsession with posted rules and regulations. 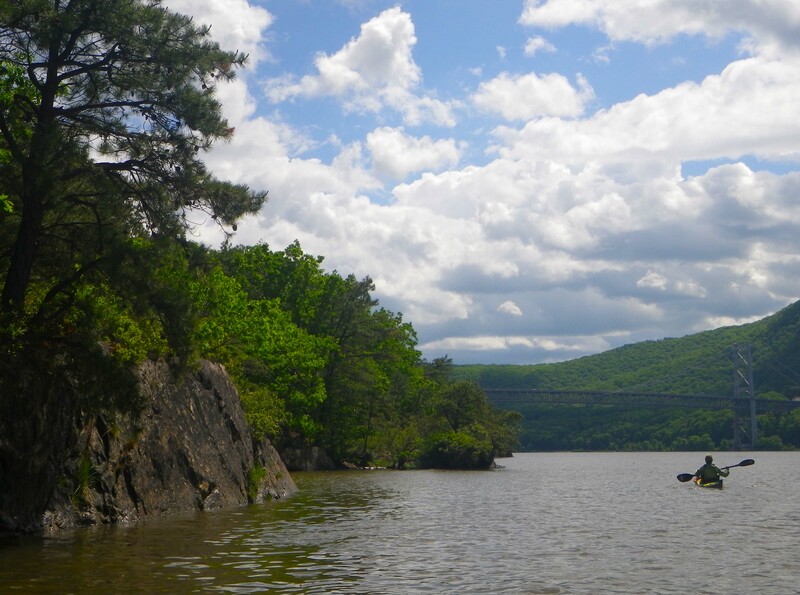 Then it’s on to Croton Point, our last campsite of the trip. 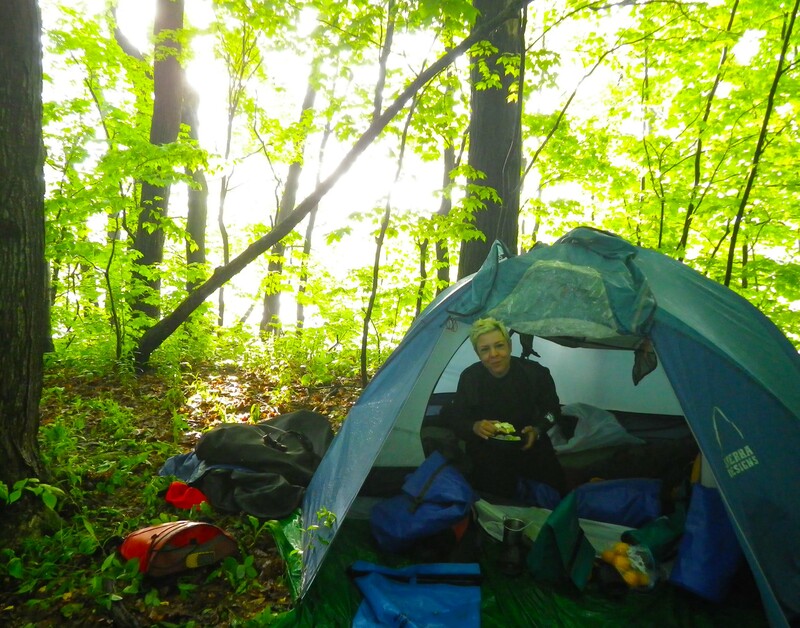 This is the most official of our campsites: It’s even part of New York State’s vaunted Hudson River Valley Greenway Water Trail. 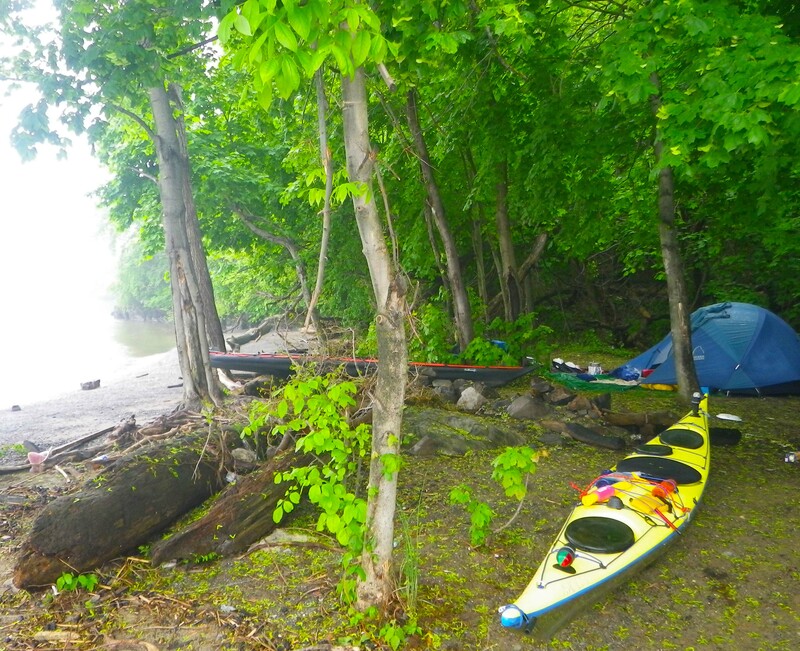 Yet the officials in the visitors’ center of Croton Point Park swear they’ve never heard of kayak camping (though, as we are leaving, they mention that there is a certain beach…). The evening is clear and dry, the sunset is splendid, and we finally feel like we’ve gotten this camping stuff right. Except for one small thing: There’s a steep slope at the back of this beach, and we are forced to camp almost on the beach itself, just behind the logs deposited by the highest tides. But today the tide is coming in even higher. We go to sleep around 11 PM. By 1 AM, Vlad is up checking on the tide—it’s halfway up the beach to the kayaks. By 2 AM, we’re both up, frantically moving the kayaks up the slope to escape the encroaching tide, which eventually stops just inches short of our campsite. And by 4 AM we’re up again, this time for good: We’re hoping to catch the start of the 6 AM ebb for the final leg home. The good news: We manage to launch promptly at 6 AM as planned. The bad news: The ebb has already started, early. 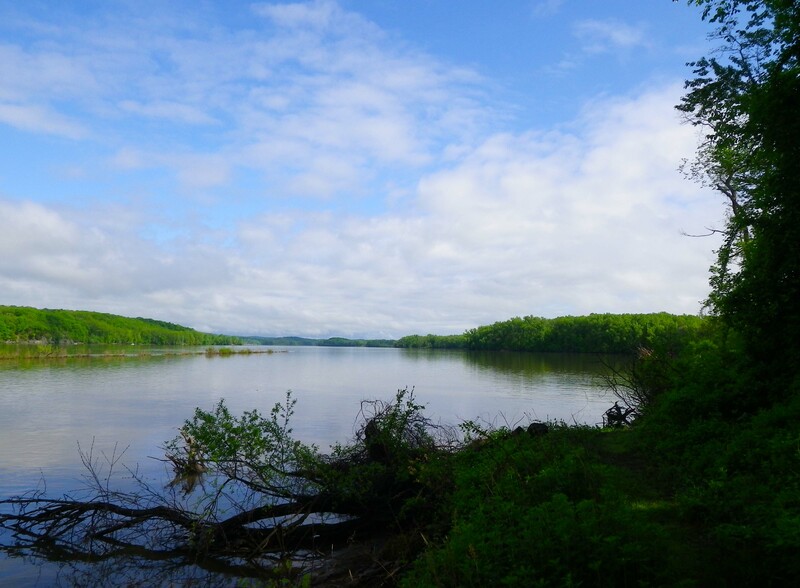 Our goal was to ride the full length of the ebb down the Hudson all the way to Manhattan… but if the ebb has already started, our chances of making it all the way before the current turns are diminished. At any rate, we set out for the last leg of the trip, about 30 miles, now in familiar territory, passing all the familiar sights and monuments. Sure enough, the current turns at about 11 AM, and we spend several hours crawling down the New Jersey side against the current. But we pull into Pier 40 about 4 PM, well satisfied with our efforts. And what about that question? Why is camping fun? 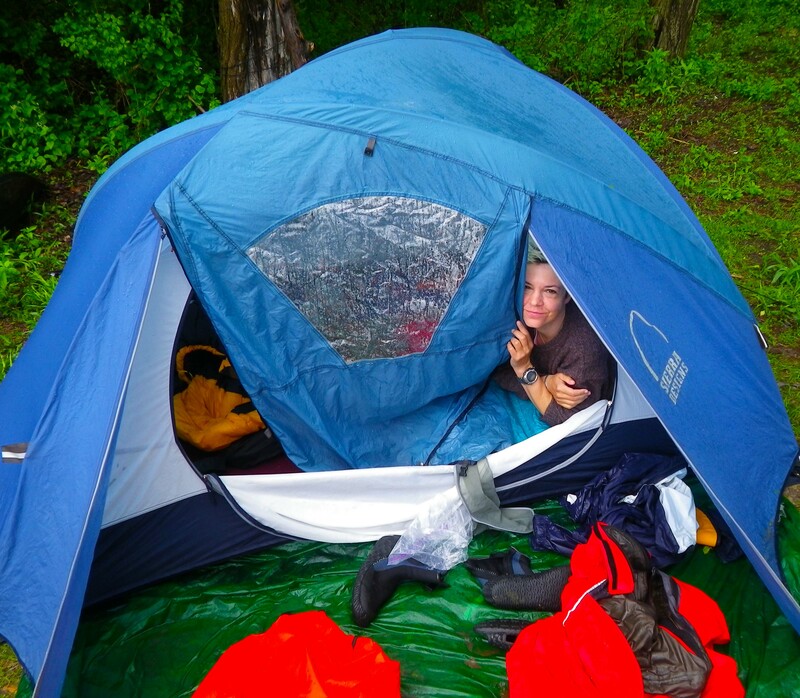 Camping is fun because it’s exactly like life, except more intense and less complicated. Every day you’re faced with a simple set of challenges: Reach the next waypoint, make dinner, survive the storm. When you are focused, you are focused 100% on those challenges and not worrying about anything extraneous. And when you’ve met them you feel a real sense of accomplishment. But that’s just one aspect. There’s also what you’re experiencing when you’re not focused (which is most of the time): the sheer physical joy of water sluicing over your body, the wind in your hair and your nose, sunshine lighting up the world around you. And the way things taste! The taste and smell of food is luxurious. Partly it’s the effect of exercise. But somehow it’s more than that: After a day or two of being in nature, you feel like you inhabit your own body more fully. In sum: When you’re camping, you feel alive. All of Vlad’s photos of the trip are here. 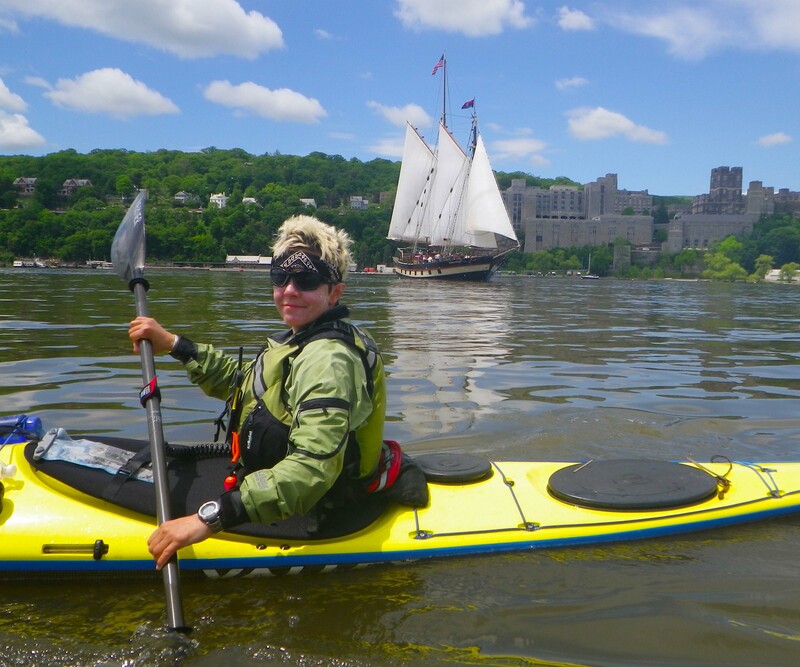 This entry was posted in Kayaking, Nature and tagged Albany, Hudson River, Kayak Camping, Kayak Expeditions, Kayaking, New York City, Rain. Bookmark the permalink. So glad you’re getting to experience the world from this vantage point. Seems absolutely incredible. It is…. wish more people could do it! Another nice trip report. 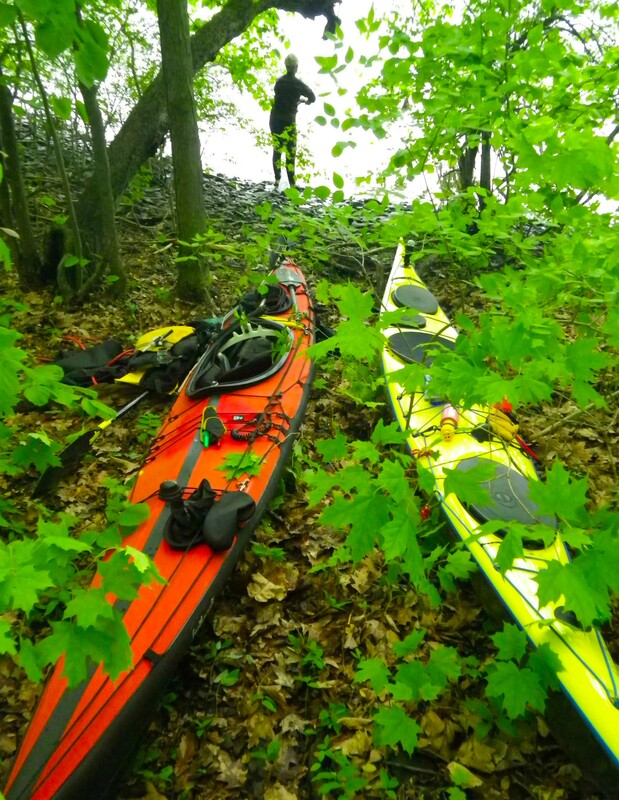 When you “stashed” your kayaks and went upland, how much effort did you take to secure your stuff against theft? I am probably overly cautious, but whenever we (people from the Inwood Canoe Club, far northern Manhattan—stop by sometime!) go upland, I leave somebody with the boats. This cuts down on the fun, of course. Great question. The short answer is—we don’t. On the trip from Albany, we really weren’t out of eyesight of the boats except once: When we stopped at the restaurant, we left the boats on the side of the train tracks, just out of eyesight. We asked a couple people if they’d be okay, and they said, “For sure”. Turned out they were right. 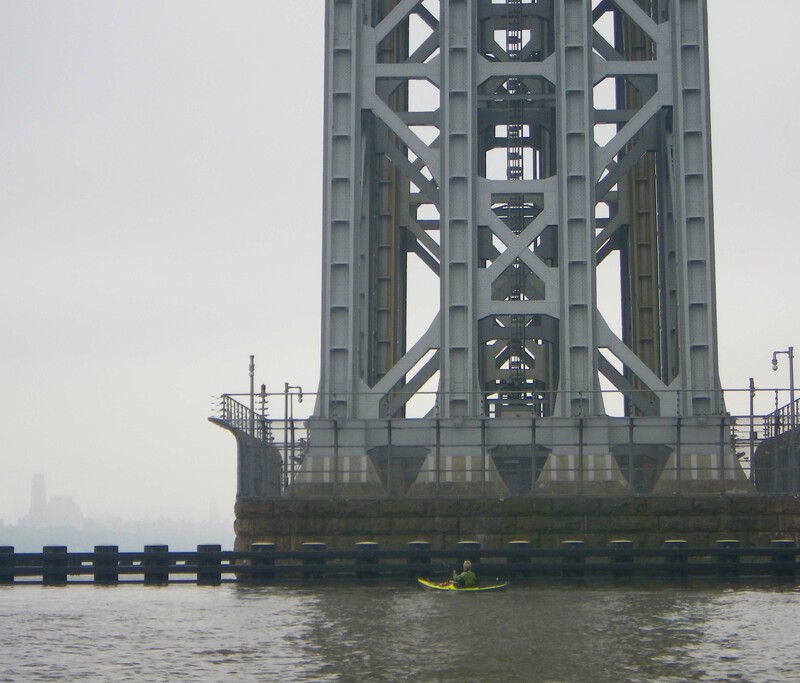 More generally, in our paddles around NYC (we paddle out of Pier 40), we often leave the boats unguarded, usually for no more than an hour or so. One favorite trip is heading across the Hudson to Hudson Tea in Hoboken, where we leave the boats on the beach while we go around the corner for some carrot cake and cappuccino (the shop is actually called Ganache). We leave the boats, paddles, spray skirts and sometimes PFDs. Nothing has happened thus far (it’s been 3+ years) but that’s not saying it won’t ever happen. Frankly, I just consider it one of the amazing things about New York—like the fact that thousands of people regularly gather in Central Park without (most of the time) killing each other. Very interesting that you can leave valuable gear lying about and no one will take it. I guess it’s both hard to transport and hard to fence. Maybe also hard to identify as valuable, unless you’re a paddler. Yeah… While it’s true that people will steal anything (anyone read about that recent rash of high-end stroller thefts in Brooklyn? :-) it’s also true that stinky neoprene-scented kayaking gear really doesn’t represent the, ah, juciest target. Anyway, not saying it couldn’t happen… probably will… but why let fear of the indeterminate future spoil the pleasures of the day?? I know some people who remove the paddles from the kayak somewhat like removing the keys from a car when they leave their kayak. 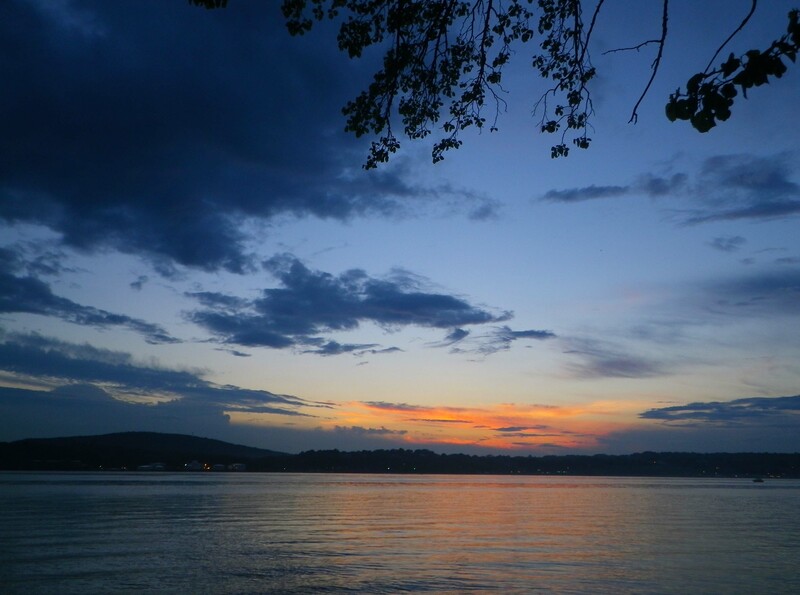 As a Croton resident who has talked to the Croton Point park employees, they are fully aware of the kayak campsite. They might not like it, so they do not talk about it… It is a very nice park, and the small hill is the result of it being the garbage dump for Westchester, and even a superfund site. 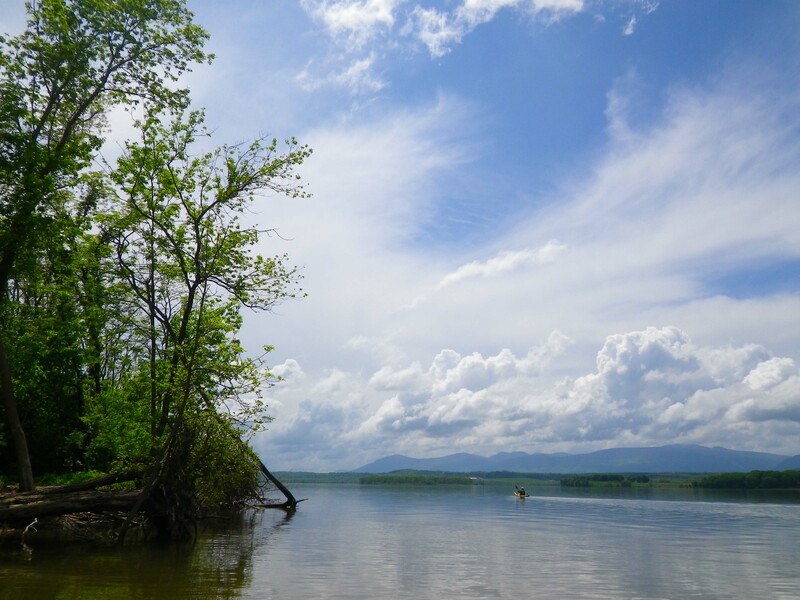 In January and February you can kayak around Croton Point and reliably see Bald Eagles. A gripping story, Johna! And an amazing feat of endurance if you ask me. Thanks! The actual paddle wasn’t much of an endurance feat… we stopped often. Really only the last day was tough (we had to go against the current from the GW bridge, so it took a while). But it was definitely amazing! I loved this article! I am in the process of planning my own trip down the river with my Dad. 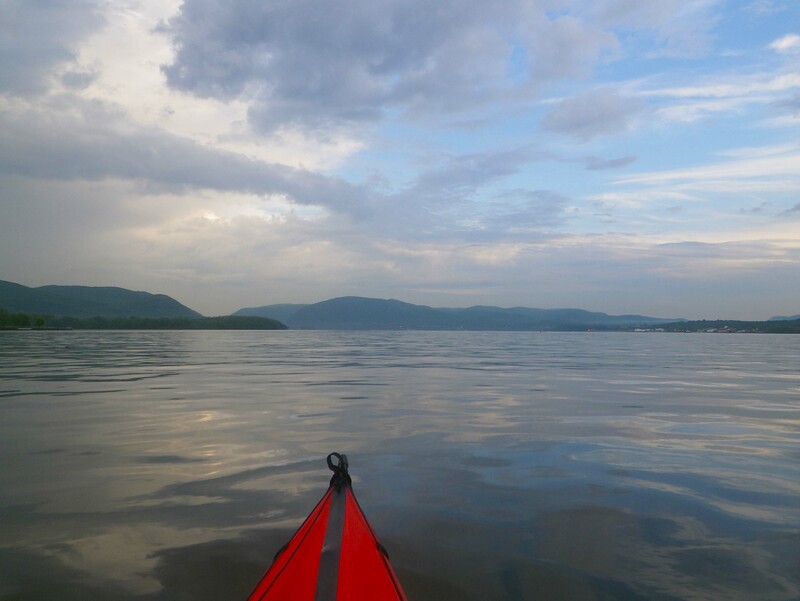 I live near Cold Spring, NY and always dreamed of Kayaking down the Hudson…and this summer we are making that dream come true. I was wondering how the currents affected your ride in various stages? 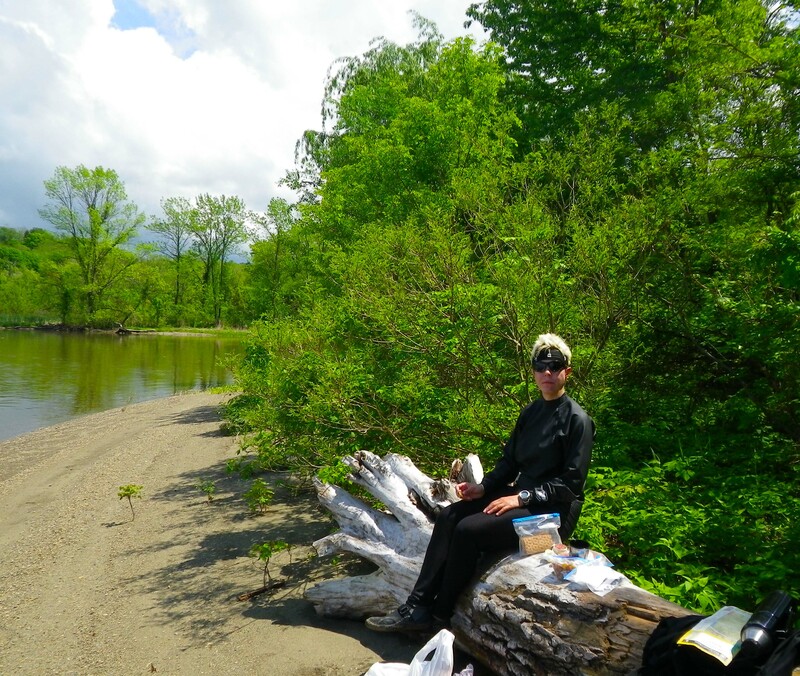 I know the ebb is defnitely stronger the further you go South, but did you have to stop along the way at all to minimize work effort going against the current (sitting by the shore helps of course too)? How hard was putting in all those miles each day? Were both athletic and avid outdoorsmen, so were looking to capture the true beauty of all the Hudson but at the same time try and finish between 5-6 days. Thanks! I hope you do go—it’s a great trip, and very doable! Actually, the ebb does not get stronger the further you go south. Here is a very useful table of current speeds at various locations along the Hudson River between NYC and Albany (scroll to the middle of the long page), along with the links to the predictions for each day at each location. You will see that the speed of the ebb increases as well as decreases along various stretches of the river, depending on such factors as the width and depth of the river. 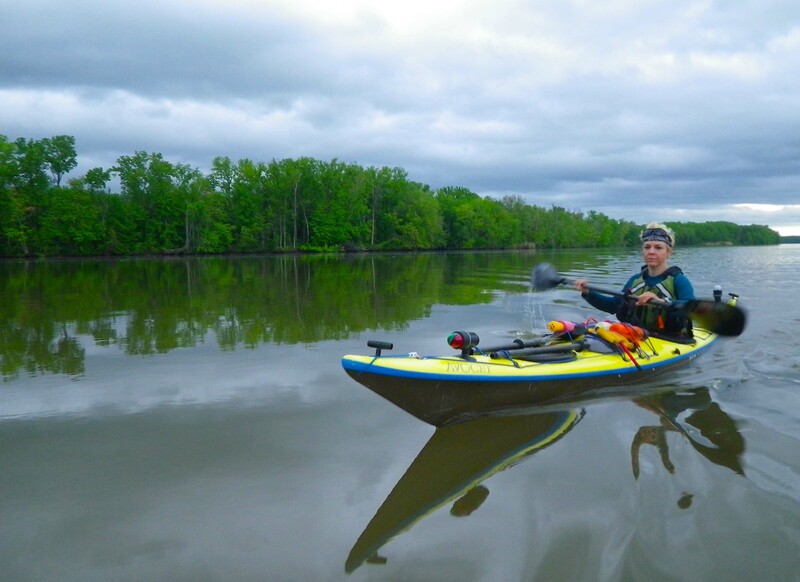 (It is generally true, however, that the ebb is stronger than the flood at any particular location, which is one reason for paddling from Albany to NYC rather than the reverse.) In any case, this information should help you plan. It really pays to paddle with the current. It certainly is possible to paddle against the current, and in many places there are even counter-eddies that will help you do that. But with the current you are free to pick your route down the river, sightseeing along the way or not as your fancy takes you. And on average you will probably be covering ground twice as fast with the current as against it. So I would plan to paddle on a block of days when the ebb occupies the middle of the day (50 minutes later each day, of course). Remember that the ebb lasts 7 hours, as opposed to 5 hours for the flood. 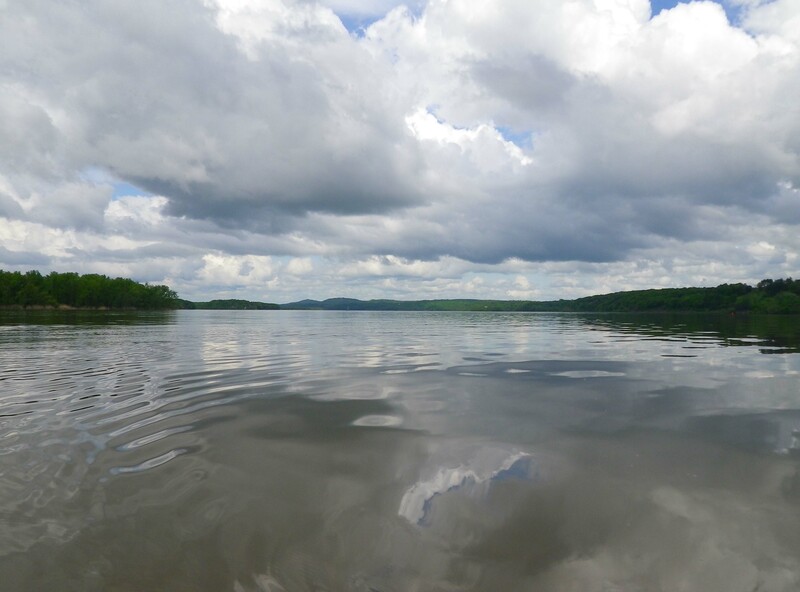 (On the other hand, paddling down the river, you won’t have quite the full 7 hours, because there is a progression in the timing of the tidal currents up the river.) In those 7 hours you can easily cover the 25-30 miles that you will need to cover if you want to finish the trip in 5 or 6 days, and still have plenty to time to see the sights, and to sleep at night—assuming that that is your preference, of course! If you are delayed and need to make up time, you can of course paddle during both of the periods of ebb during each 24+ hours. That will interfere with your sleep rhythm, however. 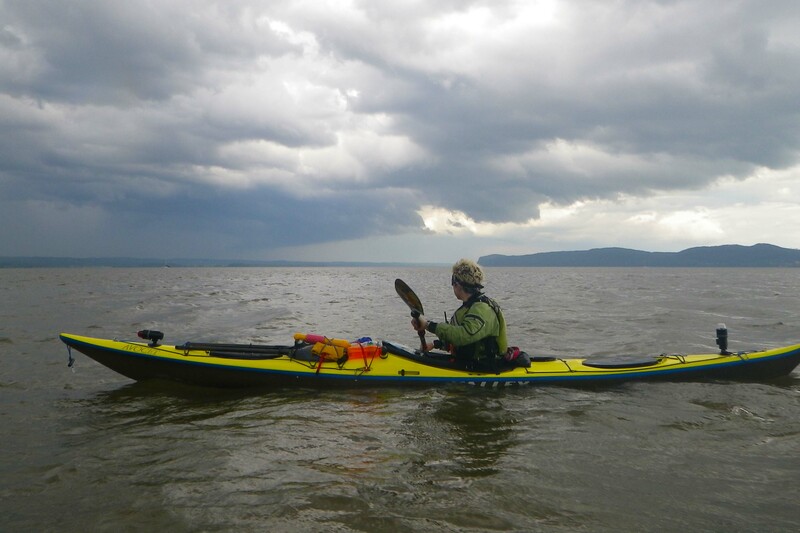 In any case, provided you have some practice in long-distance kayaking so that you avoid beginners’ pitfalls, you should have no problem completing the trip, and you will have a lot of fun! 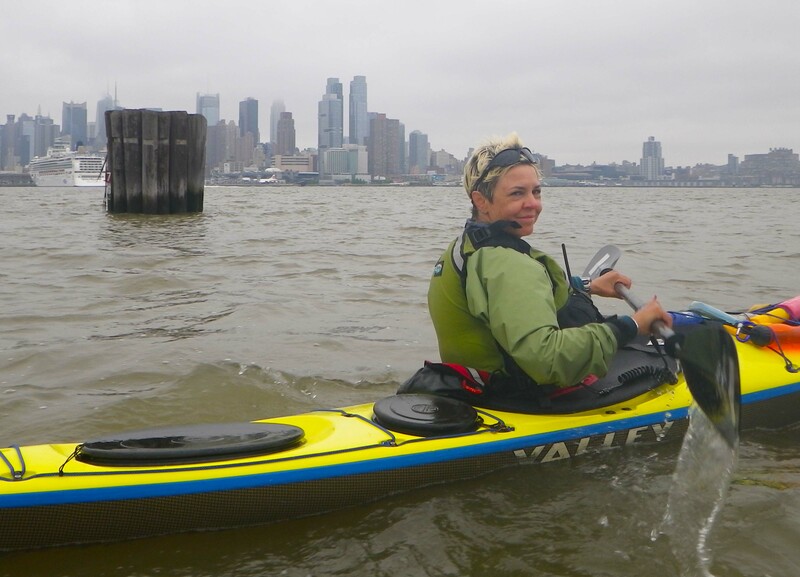 Hi Johna- We greatly enjoyed reading the story of your paddle down the Hudson River. Our son and his friend are planning a similar trip and he needs some equipment- is there anything, besides the obvious supplies, that you can recommend for him? Thank you! We are glad you enjoyed, vicariously, our trip! And best of luck to your son and his friend—it’s really a satisfying and memorable trip! There isn’t really anything special they need that I can think of. 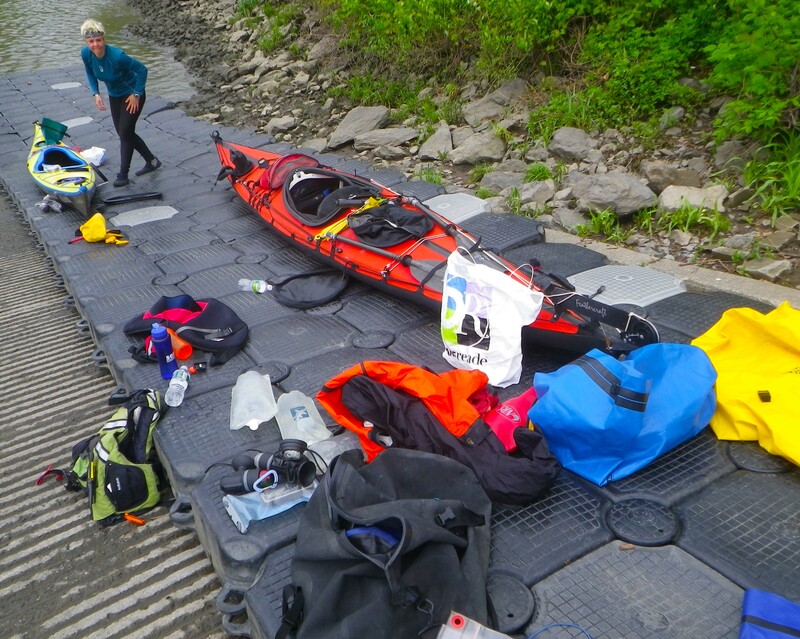 They need their usual equipment for their time on the water—I assume that they are making the trip by kayak or canoe—and then the usual equipment for camping. Plus food and water of course. There are enough marinas and little towns along the way that they can easily resupply if necessary. I would say definitely take a couple of tarps. Even if they’re lucky enough not to encounter rain, it’s nice to put the tent on a tarp instead of directly on muddy ground. What else? Bug spray, big time. Especially this year–our mild winter has produced a bumper crop of biting beasties, and some of them can cause real damage (think ticks/Lyme disease). Money and ID, just in case. Sun gloves are helpful (I know, they look goofy, but they’re a good way to protect against painful burns on the tops of your hands—and putting sunscreen on your hands often makes them slippery). Lots of water. As Vlad says, there are places to resupply, but this isn’t an urban trip–there are also long stretches with nothing. That’s about all I can think of. Well, one more thing: If they’re making the trip all the way down into Manhattan, they should be sure to bring maritime lights and (if possible) a radio, just in case they’re dodging shipping vessels after dark. is there a progressive guided tour of the hudson from albany to points south? either the rhinebeck area or manhattan. I’m interested in camping and paddling for two or three days. I had seen a trip advertised but I’m unable to locate the info. 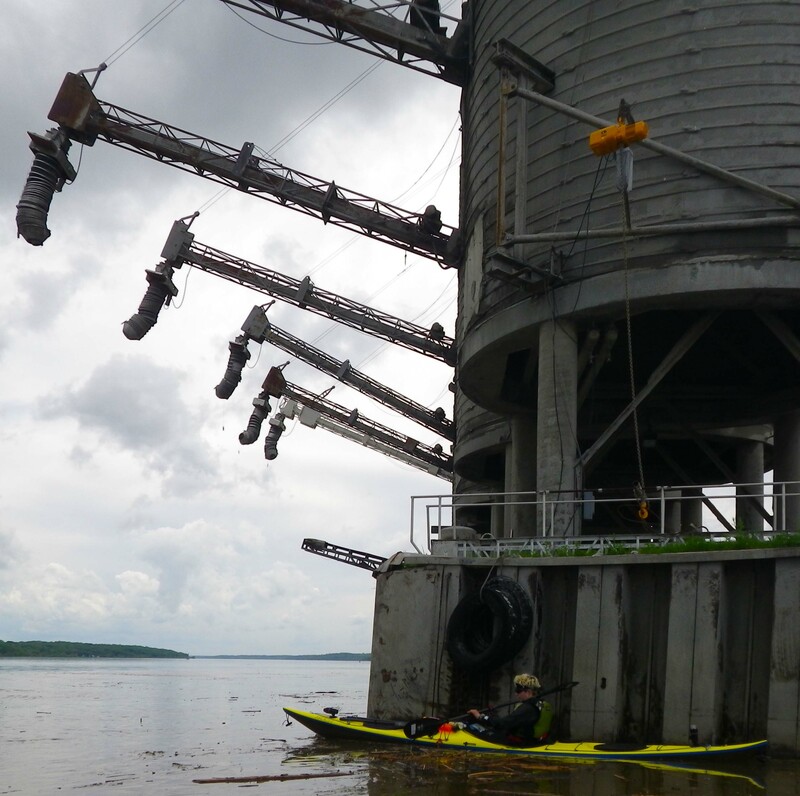 Go to the Hudson River Watertrail Association site, specifically to this page. You will see a map of the river with all the sites marked. You will see that Denning’s Point is listed as legal for camping, but Little Stony Point is not (day use only). 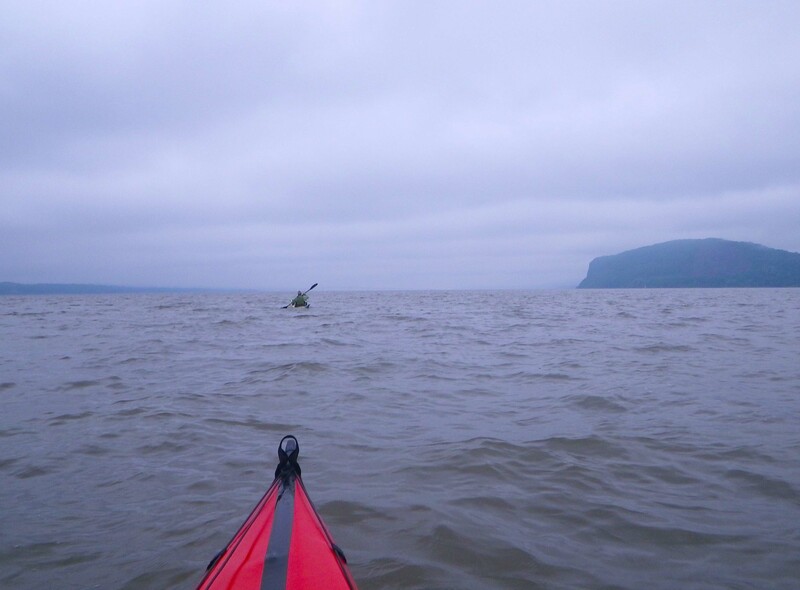 Hi I am planning to kayak the entire Hudson River next summer. I just ordered the Hudson River water trail book. I would appreciate any advice for planning my trip. Thanks in advance for your help and insight. When you say the “entire Hudson River”, do you mean more than the tidal part, from Troy south? Because that’s the only part that we have experience of. We get this question a lot, and I think a lot of the information I would start off giving you is already contained in this post and comments, in particular my answer to Kevin above. Thank you for your prompt response. We are planning on kayaking higher than where it is tidal. Your post to Kevin was very informative. I guess since I am in the beginning phase of planning the trip, which we are not doing until next summer, I don’t have any specific questions. 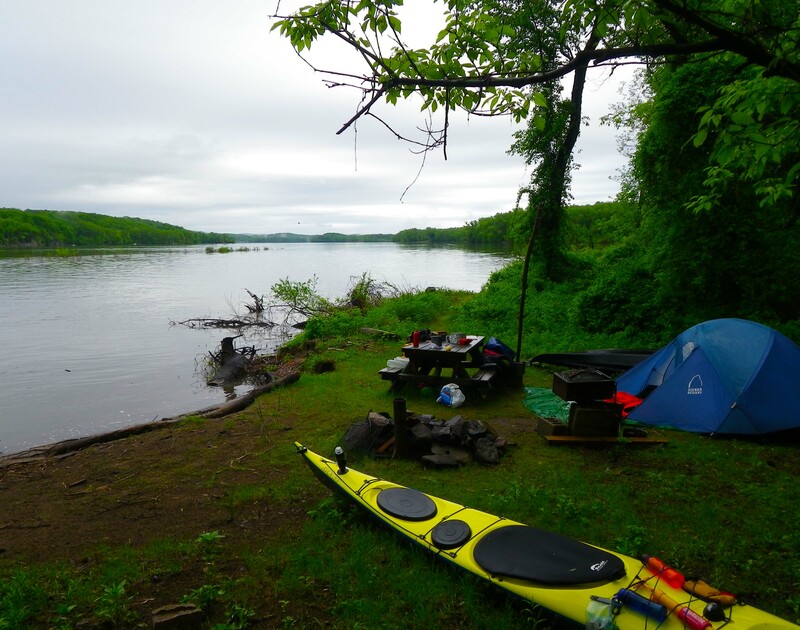 I am grateful for any general advice you can give for planning a long distance kayak/ camping trip. As our trip draws closer, I am sure I will have many more specific questions. Once again, thank you for you advice and guidance. General advice? Here and here are a couple of posts about our 2014 Everglades Challenge experience. The Florida environment, and the kind of trip, is different, but some of it might be useful. Thanks for posting a link to this in your latest blog entry as I was not following you when you took this trip. It looks like a great trip. Awesome story and some amazing information. 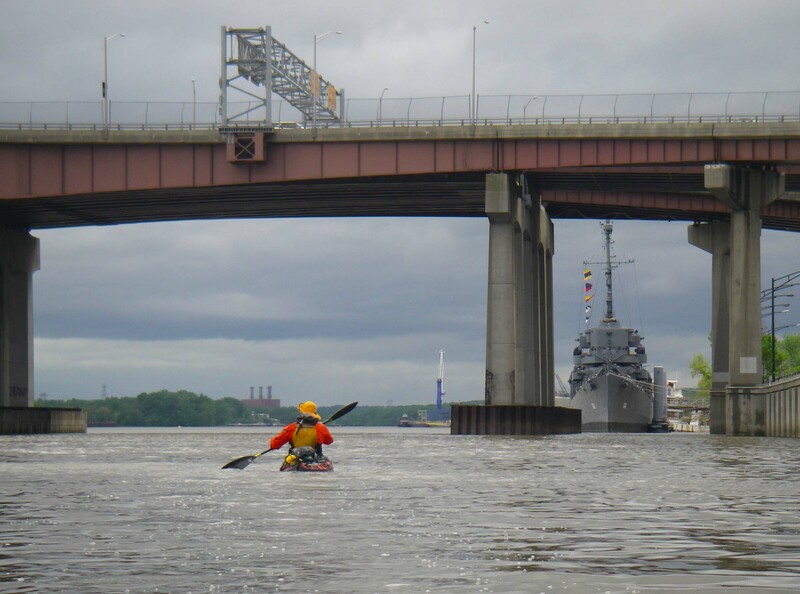 We are planning on kayaking from Albany to Manhattan, but we’re curious about kayaking back to Albany after. What are your thoughts? Is this possible? Any harder than going from ALB to NYC?